Good morning everyone! Happy Wednesday! It's time for a NEW challenge over at the 7 Kids Challenge Blog! The challenge is "Anything Goes - with an Optional Twist (Multiple Folds)". 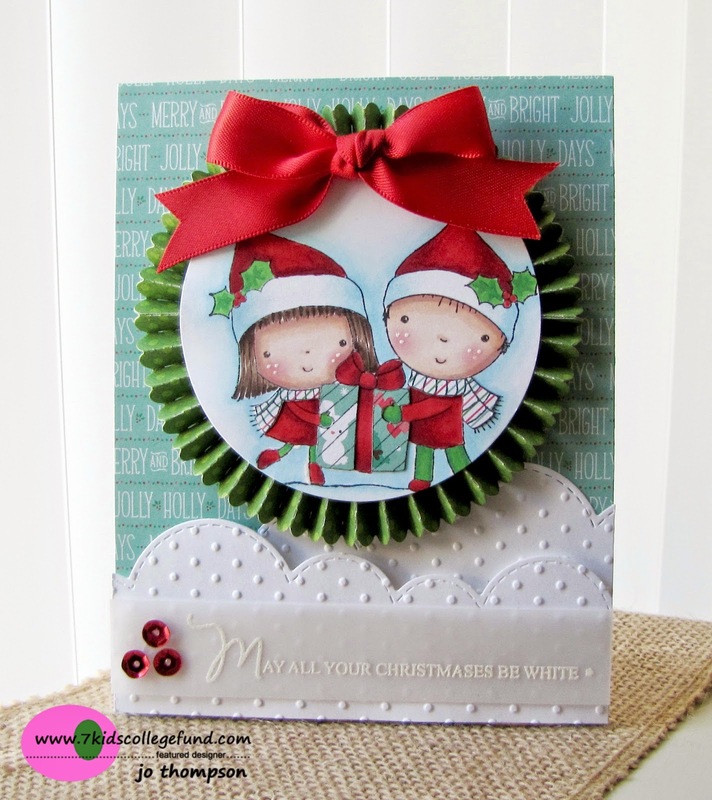 Today I created a holiday card using Penny Black - Christmas with Mimi. This is one of the many images that comes in this clear stamp set. To accent the image, I used Wink of Stella in Clear and Red, for that added shimmer. The designer paper is from Lawn Fawn - Snow Day. For the "Multiple Folds" twist, I created a large rosette, using a die, to border the circle image. 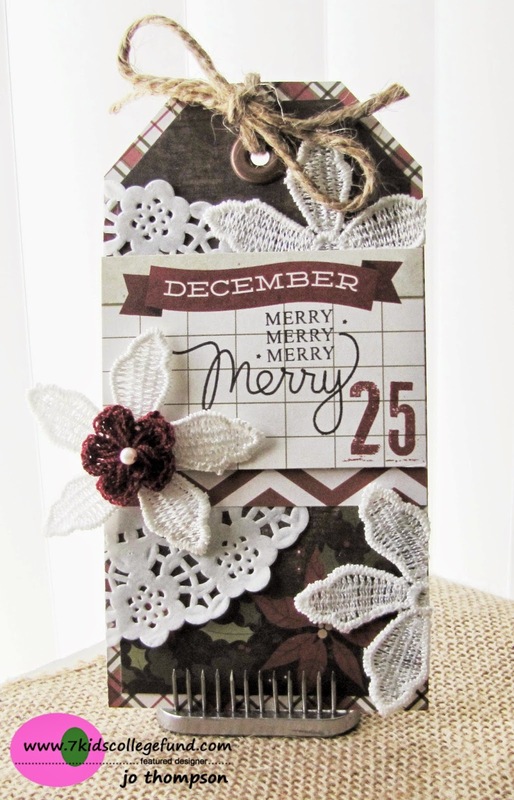 On the bottom of the card, I embossed white cs with small polka dots and used the Mama Elephant - Landscape Trio Dies to create a fluffy snow border. 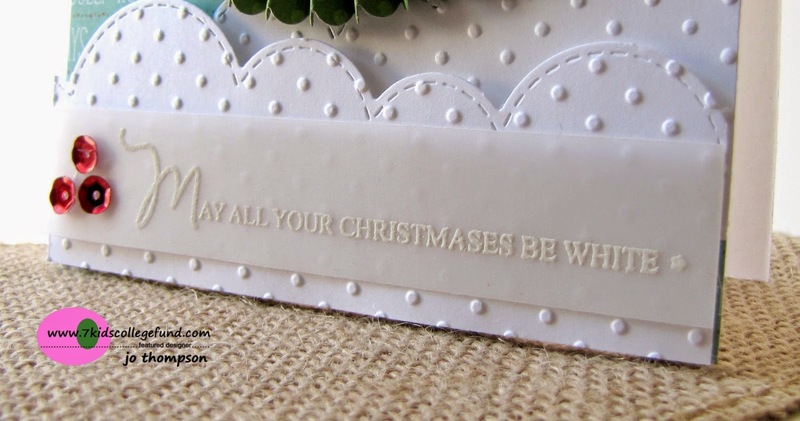 Lastly, I white embossed the sentiment from Mama Elephant - Merry Greetings on vellum paper. For red accents, I added a trio of red sequins and a red satin bow for a pop of color. So that completes my card for this challenge. Can't wait to see what you create! Thanks for stopping by! 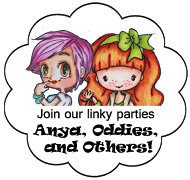 Come join in on the fun over at the 7 Kids Challenge Blog! Enjoy the rest of your week! Is it Friday yet?? No?...Oh well I thought I'd just ask, just in case LOL. Hi everyone, I wanted to share this card I made using C.C. Designs Geisha Emma. This set includes two other images, but I chose this one for now. I stuck with the traditional Japanese red/black color combo and added gold accents. She is colored with my Copics (hope to have a coloring video up soon). For shimmer accents, I used Wink of Stella in Clear and Red, also Gold Stickles. I wanted to mimic the fan that she is holding, so I created one using the TH Rosette Die. I added a black satin bow and a red cherry blossom to finish it off. The sentiment "Arigato" is gold embossed on a a vellum fish tail banner. Other supplies include a 3" circle punch and a doily die. 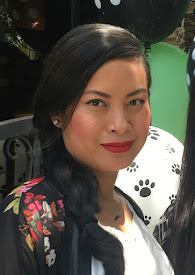 Thank you so much for taking the time to visit my blog! Have a fabulous week! 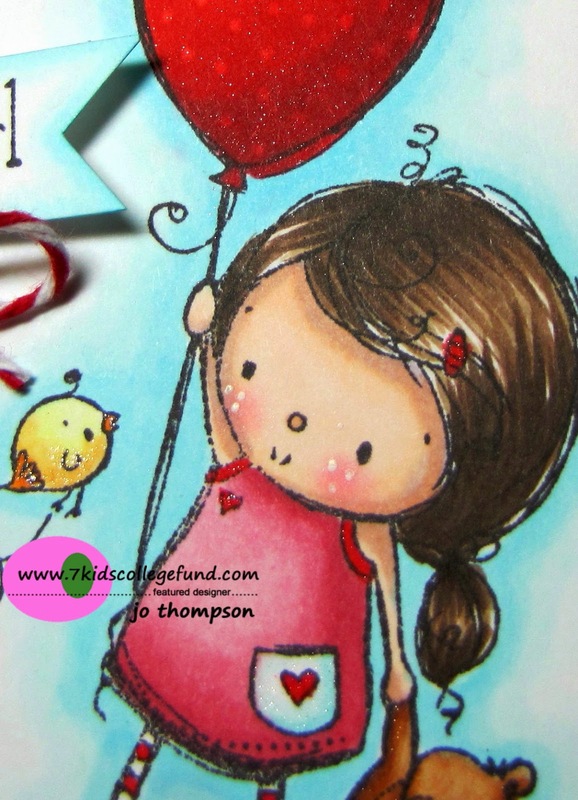 Happy Saturday everyone, Jo here sharing my card using Kraftin Kimmie Stamps - Birthday Girl. She's adorable, oh just floating in the sky hanging onto one red balloon for dear life LOL. She is colored with Copics. The pattern paper is from Jillibean Soup - Birthday Bisque. The edge of the image is trimmed with Mama Elephant - Landscape Trio Dies. 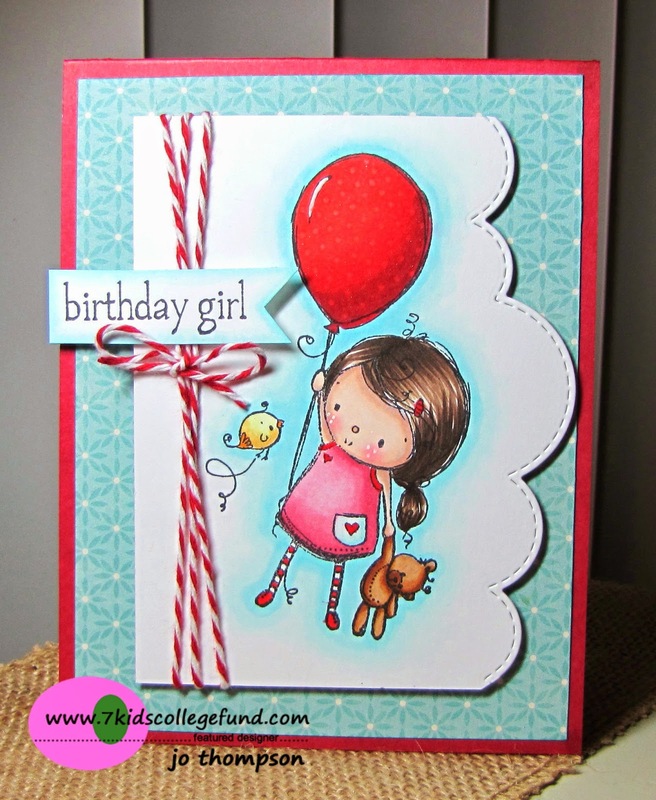 I added some red & white twine and adhered the "birthday girl" sentiment (from the stamp set) just above the bow. Hopefully you can see it, the balloon image, as well as parts of the dress, are accented with Wink of Stella in Clear and Red. I love the simplicity of this card. Thanks for stopping by! 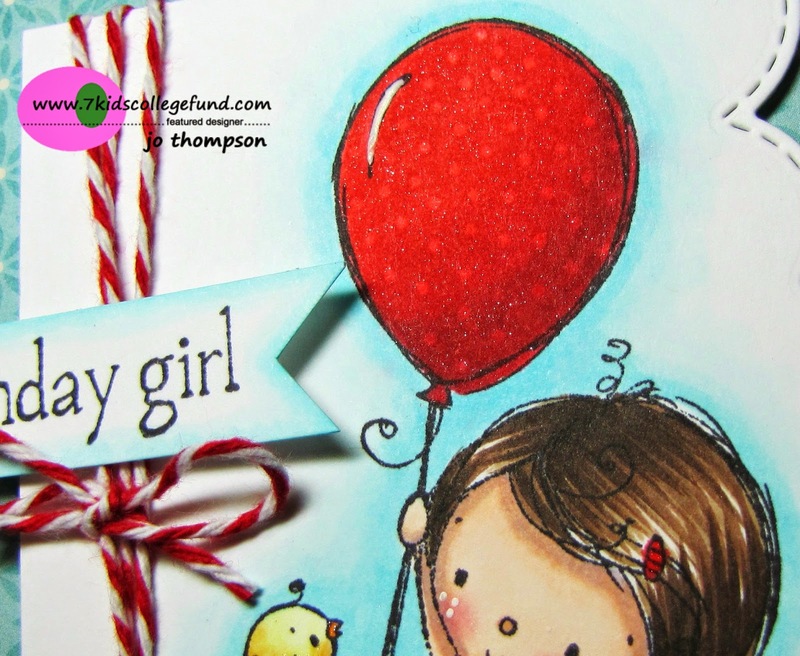 Come join in on the fun over at the 7 Kids Challenge Blog! Have a beautiful weekend! 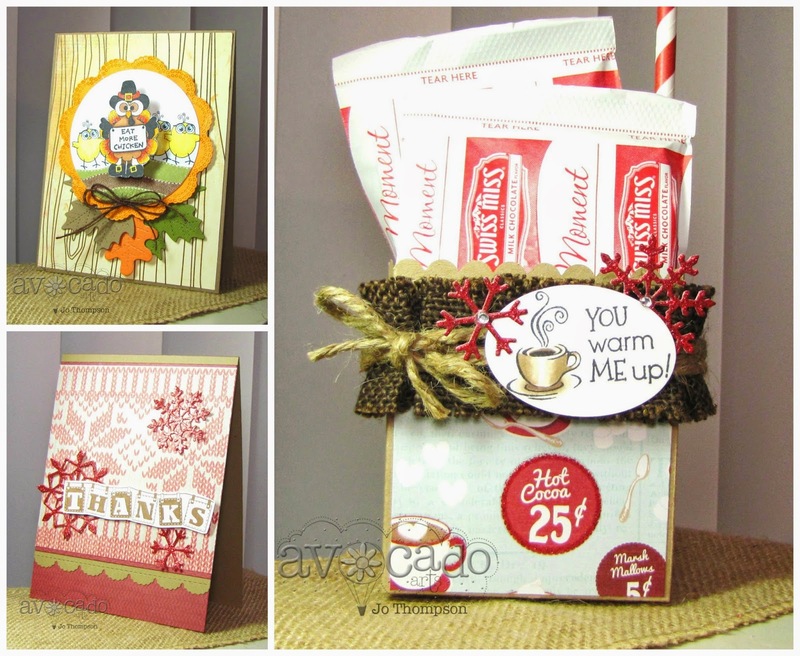 Today I'll be sharing two Christmas themed projects and a Fall themed project. Let's go! Project 1: You Warm Me Up! I decided to make a cute little treat bag using the "You Warm Me Up!" sentiment, stamped on 110lb CS and colored with my Copics. I had the perfect paper to go with this hot cocoa theme. The treat bag contains two packets of hot cocoa and a paper straw. I added some burlap trim and jute rope. For a more holiday feel, I cut some red glittery snowflakes. 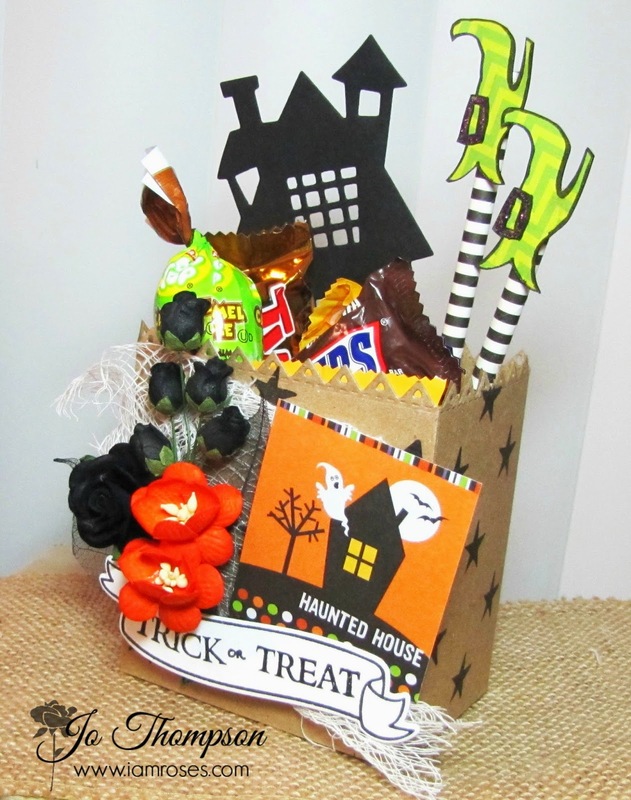 Here is a video tutorial on how to make this treat bag over on my YouTube Channel: Paperdrama. Keeping with the holiday theme, I created this Thank You card using the sentiment "THANKS". I used some designer paper that looks like a sweater and added more of the glittered snowflakes. Hahaha, okay this card was so fun to create. I used the cute Turkey image in the stamp set and colored it with my Copics. 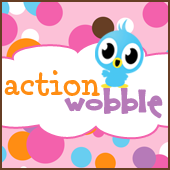 To make the card more interactive, I placed him on an action wobble spring. He's just a normal turkey trying to get a message out there. 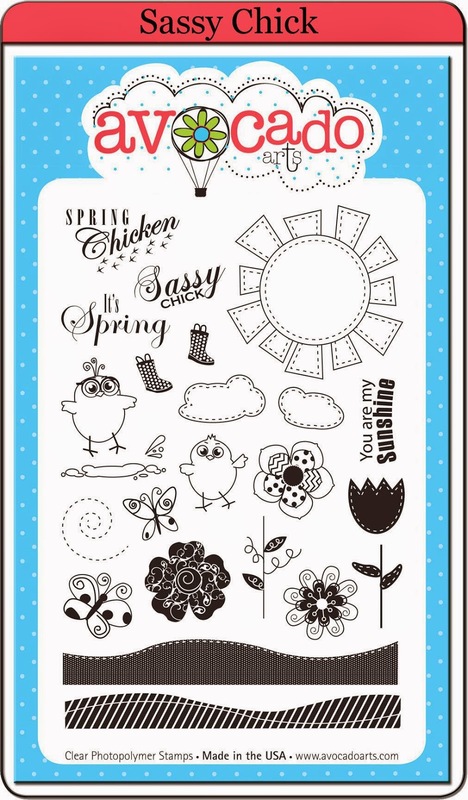 The cute chicks and the sloped hills are from the stamp set Sassy Chick. Be creative and have fun with this set! Thanks for stopping by today and enjoy the rest of your week! Hello everyone! A new challenge is up over at 7 Kids Challenge Blog, "Anything Goes". 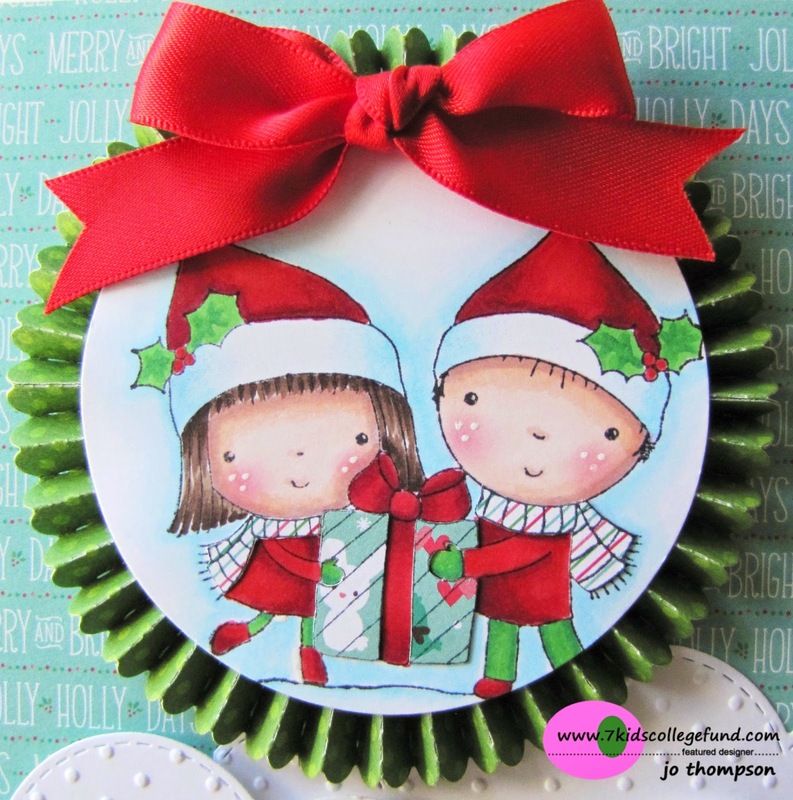 I created a holiday tag.....Christmas is fast approaching! The designer papers are from Simple Stories - Cozy Christmas. The tag measures approx. 4" x 7. 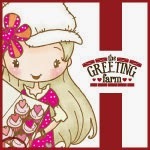 The sentiment "Merry Merry Merry Merry" is from Mama Elephant - Merry Greetings. I've used this on other projects as well and I still have many sentiments yet to use. 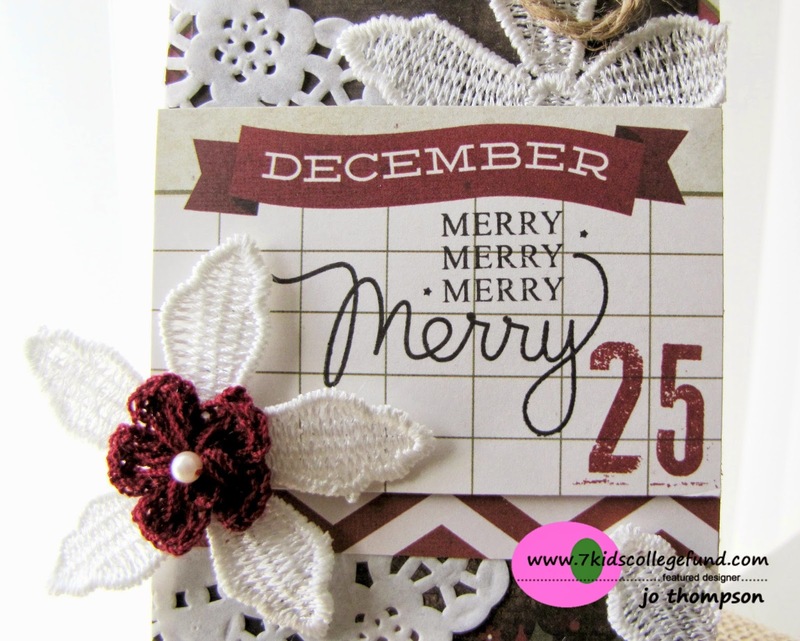 For the background, I added a Doodlebug Designs Paper Doilies - Lily White. I am in love with the Prima White 5-Petal Flower Trim. I cut the individual flowers and adhered it several places on the tag. I also layered it with a mini crochet flower from my stash. I finished off the tag with an extra large eyelet and some jute rope tied in a bow. I'm sure that this tag will adorn one of my presents for the holidays. 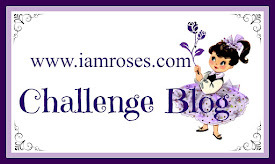 Come join in on the fun over at the 7 Kids Challenge Blog! Happy Saturday! Today I'm haring a holiday gift tag. I decided to take a mini break from Halloween. Let's get started with what I used to create this tag. 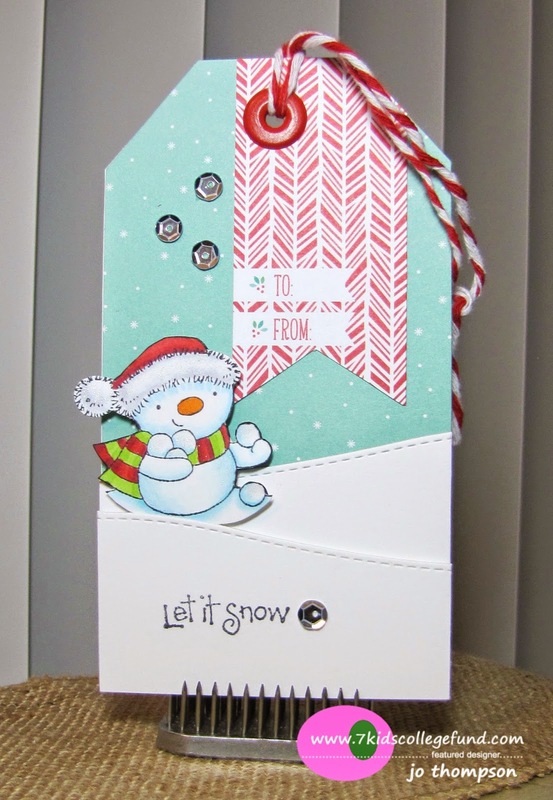 The designer papers are from Lawn Fawn Snow Day. The cute snowman image, colored with Copics, is from Penny Black Christmas with Mimi. 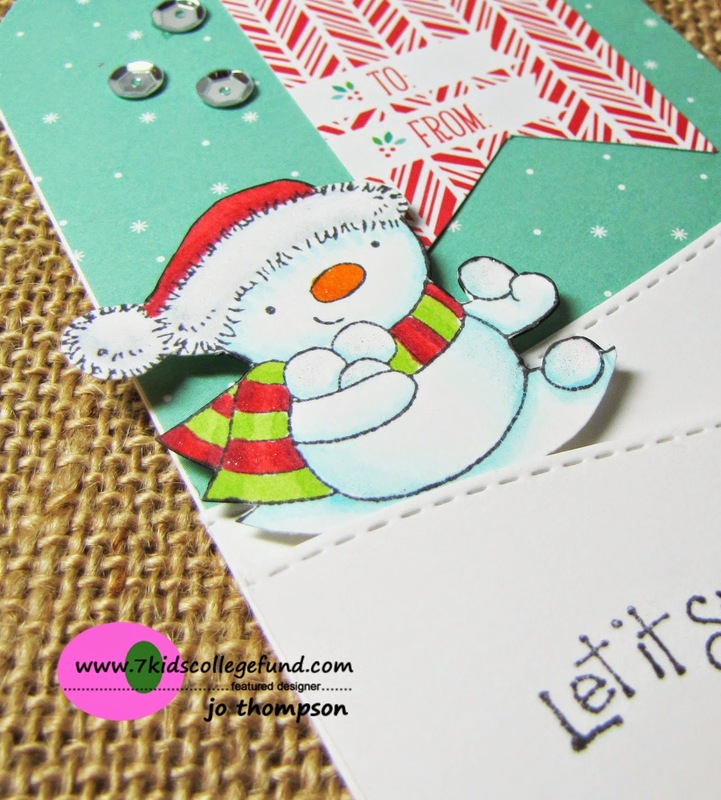 I created the snow slopes using the stitched Landscape Trio Dies from Mama Elephant. Lastly, a bit of sparkle was missing, so I had to add just a few Sequins and the Wink of Stella pen in Clear on the snowman. This was easy to create, even with an empty tank of craft mojo =) Hope you liked it. Don't forget to join the current "Anything Goes" Challenge (with a Twist, using Ribbon or Lace) over at the 7 Kids Challenge Blog! Have a gorgeous weekend! Good Morning October! 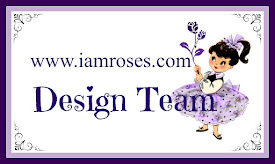 Hi everyone, here is a project I created for the I Am Roses Challenge Blog, a Candy Treat Bag. It's Halloween themed and the flowers I used were the Semi Open Rose Buds, Cherry Blossoms and Roses. I handmade the bag from Kraft CS and stamped my own background. I pulled out all my Halloween themed papers and stamps perfect for this project. For the scene in the back of the treat bag, I placed a haunted house using a die and strategically placed the Witch's legs sticking out of the bottom of the house, like The Wizard of Oz. To create the legs, I cut a striped paper straw for the stockings and I stamped a shoe 2x for the feet. The IAR Colors to use are Orange & Black and the challenge is Bags (create or decorate a bag). Come join in on the fun and get inpsired by the DT's creations. I made a mini tutorial on how to make the bag HERE.